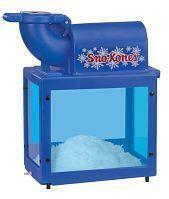 Have the coolest party of the year with this simple-to-use sno cone machine! Great addition to any event, perfect refreshment for outdoor parties! Its a snap to use, just fill with ice, push a button to shave, and serve up some fun! Comes with enough supplies (syrup, cups, and spoons) for approximately 25 servings. Additional supplies for approximately 25 servings are available at $10.00 each. Substitute supplies for approximately 100 servings for $20.00 more. Additional supplies forapproxiamtely 100 servings are available at $30.00 each. Minimium order of $150 for delivery applies.